I've lived in Asia for more than a decade now and over those years have amassed a large archive of photos that I eventually plan on using for future blogs. Admittedly however I’ve been extremely slow in getting to them. When I opened this site I hadn't really expected the blog to turn out the way it has but I think that is probably a reflection of not only wanting to show my photos but also tell their story at the same time. Since I've started blogging I have spent so much time working on specific projects with regard to Taiwanese history and culture that I’ve pretty much put all of my other work on hold and there is a major backlog of photos from all over Asia that need some attention. Today I’m going to take a break from blogging about Taiwan and introduce a pretty cool little spot just a few hours outside of Bangkok. Before I start, I’m going to have to remind people that today I’m blogging about Thailand. Not Taiwan. Thailand and Taiwan are two completely different countries. I don’t know how many times I’ve had to explain this over the years but its better to start out with a bit of a disclaimer. 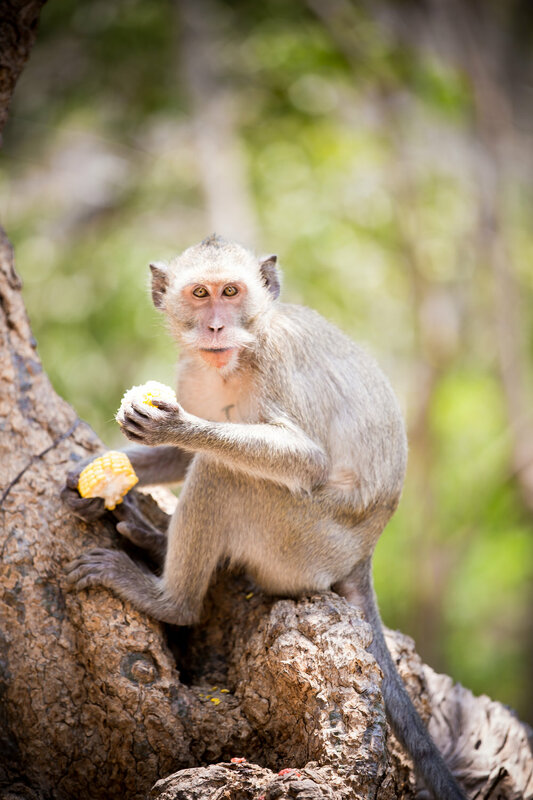 Thailand is an amazing country with a great history, culture and of course one of the best countries to visit if you’re a foodie - It isn’t however the kind of place a timid small-town inexperienced Canadian boy should be visiting if he’s not able to be assertive. When I first visited the country to do research for my thesis I have to say that I was extremely overwhelmed and had a difficult time adapting. Since then I’ve been to Thailand on several different occasions and I have come to love visiting the country. With it being such a short flight from Taiwan, it has one of my go-to countries to visit when I need a quick and cheap vacation to relax, eat great food and recharge. There are a lot of places that I could post a blog about with Thailand - Bangkok itself has a plethora of tourist attractions and beautiful spots to write about. I think however that most of these places have had their stories told a million times while the place I’m blogging about today is a little bit lesser known and is a few hours outside of the capital city. My last trip to the Kingdom of Thailand was simply to have a relaxing vacation in the resort town of Hua Hin (หัวหิน). The small town on the northern part of the Malay Peninsula is a popular destination for tourists who want to enjoy beautiful beaches and a resort-like atmosphere while at the same time enjoying the amazing culture and cuisine that Thailand has to offer. The plan was to spend a few days in Bangkok seeing some of the sights before making my way down south for a week of relaxing on the beach and then heading back to Bangkok with a few stops along the way to check out some places that I’ve wanted to see for a while. The place I was most excited to visit was located in Phetchaburi Province (เพชรบุรี) just a hundred or so kilometres south of Bangkok known as the Tham Khao Luang Cave (ถ้ำเขาหลวง). The cave wasn’t particularly a popular tourist attraction for international tourists but I had seen photos of it several years prior to my visit and it instantly attracted my attention. In the end, my visit to the cave ended up being the highlight of my trip and I enjoyed it so much that a photo of it has been the cover picture on my Facebook profile in the years since I visited. Interestingly on the same day I was touring the cave, the 2014 coup d'état led by Royal Thai Armed Forces (กองทัพไทย) was taking place in Bankok. The coup was to become the 12th time the military felt it had to step in and take control of the government since the Siamese revolution of 1932. While I was underground in this peaceful cave the army was rolling in and taking control of the government, establishing 'order' in the capital, repealing the constitution and forming a caretaker government which until today still hasn’t relinquished control of the state. All of this made was more complicated last year by the death of the much-loved King Bhumibol Adulyadej (ภูมิพลอดุลยเดช) which sent the country into a period of even greater uncertainty. So what made this cave so attractive to me? Why did I want to visit it? I would say the simple answer is the light - The light in the cave is a photographers dream. 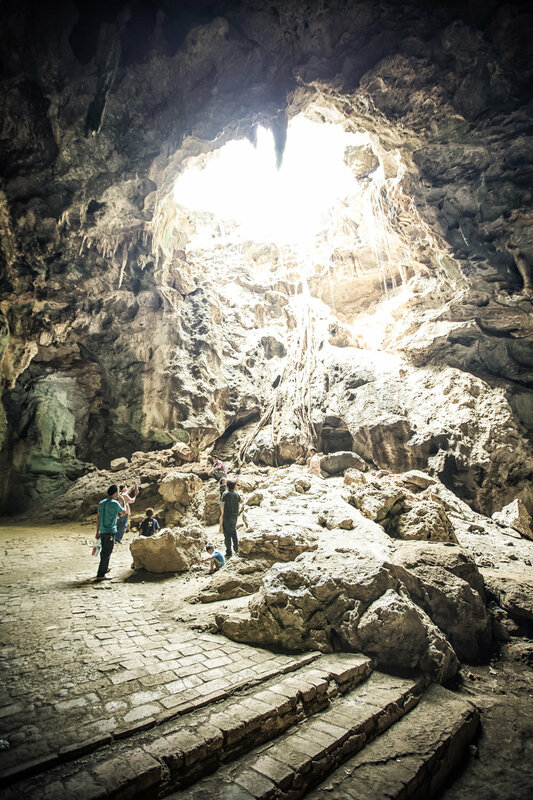 Light shines down in the cave on the beautiful golden Buddha statues from a hole above creates an atmosphere almost like any other. It's almost as if the Buddha’s are being transported up to the Starship Enterprise. The possibilities for photography here are amazing and if you are at the cave at the right time of the day when the sun is in the right spot you are in for a real treat. Inside the cave there are over 180 different statues of the Buddha at the various stages of his life as well as pagodas and a shrine where monks and volunteers perform religious rituals, sell religious offerings and work to maintain the cleanliness of the temple. When you visit you will no doubt see groups of faithful Thai people praying or meditating in front of the largest Buddha statue which makes for an interesting cultural experience as well. The cave is a short stop off of Phet Kasem Road (ถนนเพชรเกษม), otherwise known as Thailand Route 4, one of the country’s four major highways and is just north of Phetchaburi (เพชรบุรี). When you arrive you are met with a large car park and then you need to take a short walk up a hill to arrive at the entrance. 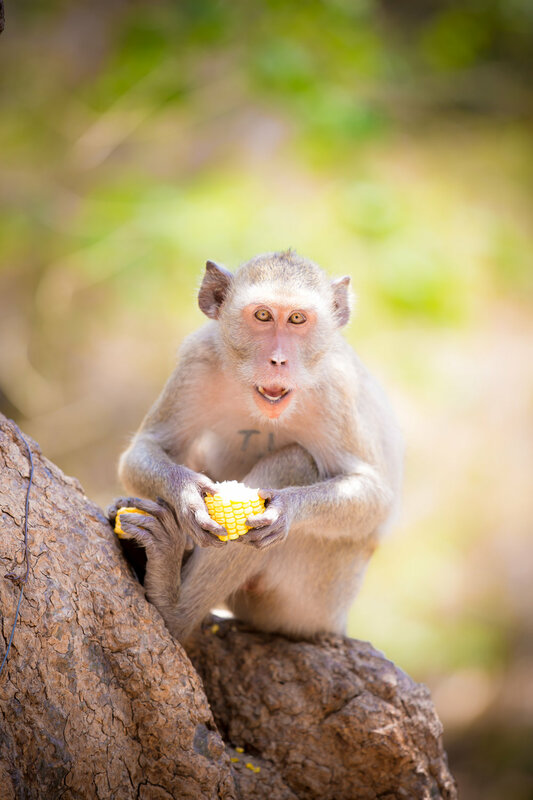 While walking up the hill and hanging out in the car park you’ll need to make sure you’re aware of the gang of wild monkeys which can be a bit aggressive if you are carrying food. There are quite a few of them hanging out along the path to the cave entrance and you’ll be under their watchful eye the whole time. 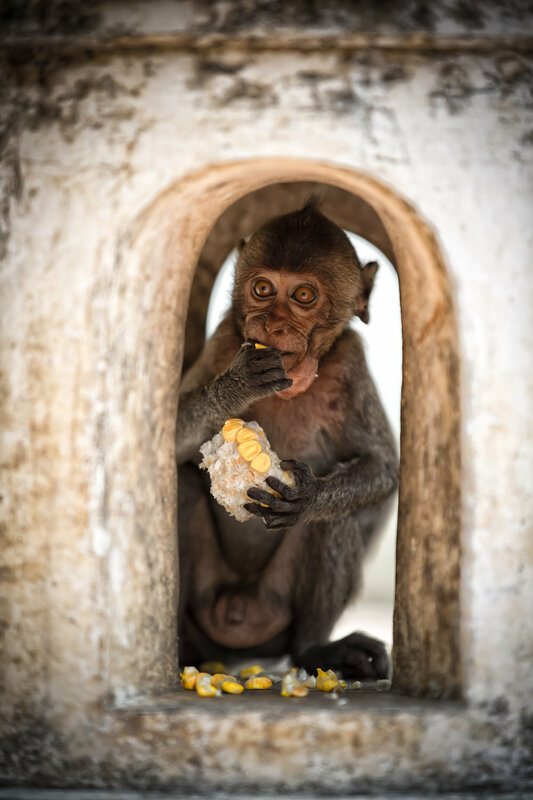 Who doesn’t love walking up a hill surrounded with wild monkeys though? When you walk down into the 27 meter deep cave you are met with a large chamber filled with stalactites (cave spikes) on the ceiling, a shrine with a large Buddha and several different paths leading to different chambers of the massive cavern where you will find several different displays of Thai Buddhist statues. As you enter the cave the first thing you’ll notice in the large cavern is not only the size of the main chamber but the beautiful three meter high golden Buddha which sits off to the right. There is somewhat of a makeshift shrine set up in front of it where visitors will present offerings and also meditate and pray. To the left of the stairs is a narrow corridor which leads to some of the other chambers in the large cavern. Each of the chambers has several statues of the Buddha at the various stages of his life but I think the most significant of all of them is the long statue of the reclining Buddha which is a popular image in Thailand that depicts the Buddha at the moment of his death. You should take a bit of time to walk around the different chambers and check out the statues which in most cases date back to the 1800s. One of the main attractions for me (and I’m sure most others) however was the light that shines in from a large hole in mountain above the cave. As I’ve mentioned above, the shape of the hole is the perfect size and shape to allow for a large cylindrical beam of light to shrine in the temple. 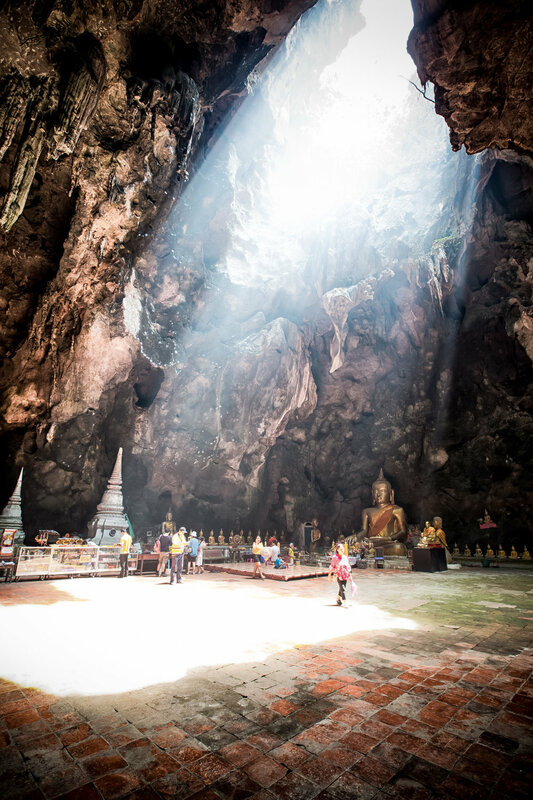 The sunlight that shines down into the cavern in conjunction with the golden Buddha statues and the haze of burning incense turns an ordinary cave into something absolutely spectacular. Historically the cave is of significance to the people of Thailand because several of the statues were cast by royal order of both King Mongkut (พระบาทสมเด็จพระจอมเกล้าเจ้าอยู่หัว) and his son King Chulalongkorn (พระบาทสมเด็จพระจุลจอมเกล้าเจ้าอยู่หัว). The two monarchs were of tremendous importance to the development of a modern Thailand and both instituted reforms which modernized the country promoted democracy. You may know a bit about King Mongkut and Chulalongkorn from popular entertainment as they were both featured in the novel “Anna and the King of Siam” by Anna Leonowens which has since spawned several different film adaptations, television shows as well as musicals. King Mongkut in particular spent quite a bit of time in the cave during his years as a monk using it as a refuge to devote himself to meditation and the study of Buddhism. 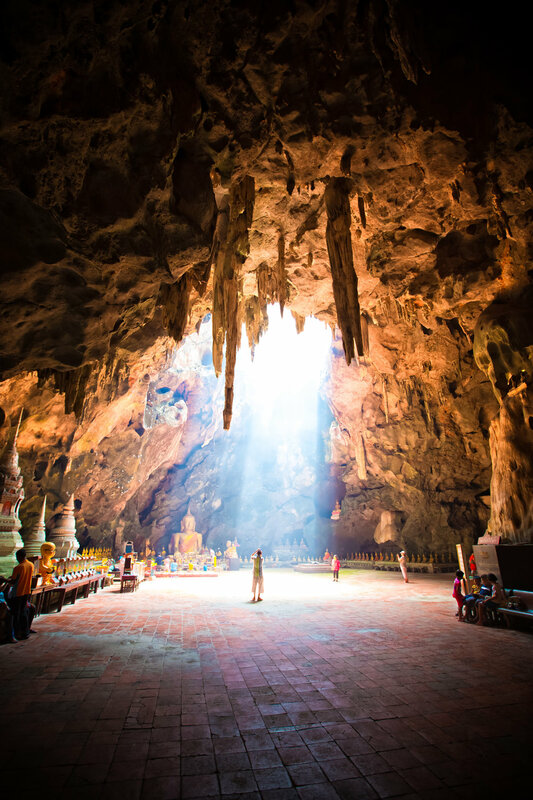 Standing in the beautiful cave with the sunlight shining down on you, I’m sure you’ll instantly understand why this place was a favourite refuge for the Thai royal family. Today it is open to the public free of charge and is a place that everybody can enjoy! If you are travelling from Bangkok the cave is about an hour and a half away from the capital or about an hour from Hua Hin. There are a number of options to get to the cave and basically when you’re in Thailand you can negotiate your own way so you’ll have to consider how you want to travel based on your budget. You can catch a bus to Phetchaburi and then from there rent a Tuk Tuk or a cab to the cave. You can hire a cab out of Bangkok or Hua Hin and negotiate a price. You can arrange a tour with several stops along the way out of Bangkok or Hua Hin. If you prefer to arrange a package tour, check around Khao San Road in Bangkok they often have signs outside of their shops which show the schedule of tours and their prices. A packaged tour will allow you to see a few different locations and let you meet new friends! For more information about getting to Phetchaburi or directly to the Khao Luang Cave click here. 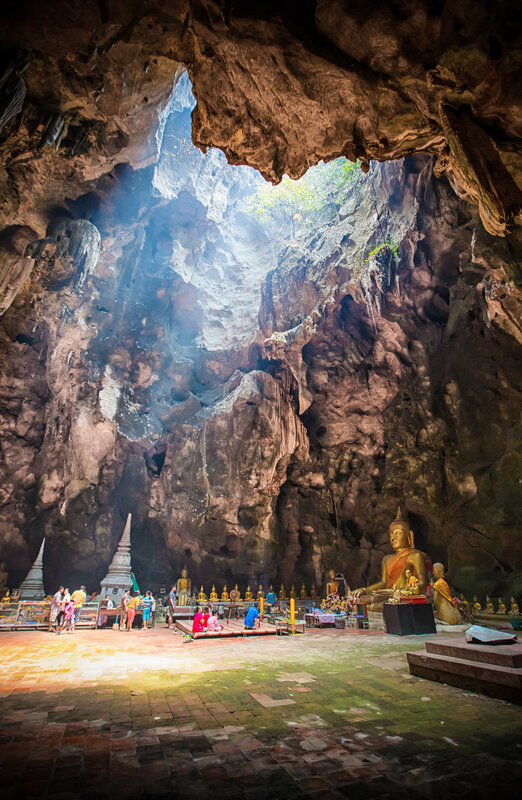 The Tham Khao Luang Cave isn’t a huge tourist attraction - You’re likely to find a lot more domestic tourists checking it out than you will foreigners. If you are heading down to Hua Hin I’d say that a stop over at the cave is probably one of the most interesting things you’ll do on your trip. If you’re looking for an interesting day-trip out of Bangkok and want to avoid the floating-market tourist traps this is a really good place to visit and can be combined with a few other locations. If you’re a photographer looking for instantly beautiful photos in a cultural setting, this is definitely one of the best places to visit. If you do plan on visiting, enjoy it and take some beautiful photos!